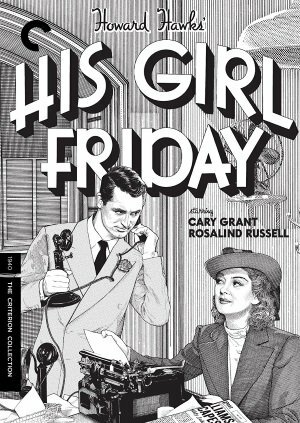 His Girl Friday (Criterion, Blu-ray, DVD) should really be listed as a double feature, for the “bonus” movie—a new edition of the original screen version of The Front Page, adapted from the snappy, cynical, double-barrel Broadway hit by Ben Hecht and Charles MacArthur—is not just a home video debut but a major discovery. The Front Page (1931) stars Pat O’Brien as the crack reporter Hildy Johnson, ready to leave the beat for marriage and an office job, and Adolph Menjou as the crafty editor who pulls every trick to keep Hildy on the job to cover a breaking story: the execution of a convicted killer who is more addled everyman than rabble-rousing radical. The film opens on a test drop from the scaffold that is to hang Earl Williams, then the camera glides over to the reporter’s room where the thick-skinned gentlemen of the press prove that they are no gentlemen. Is this the stuff of comedy? It is in the hands of Hecht and MacArthur, former newspapermen with plenty to say about the cutthroat tactics of journalists. The Front Page (Kino Classics, Blu-ray, DVD) – The original 1931 screen version of the rapid-fire newspaper comedy written for the stage Ben Hecht and Charles MacArthur stars Pat O’Brien as the crack reporter Hildy Johnson, ready to leave the beat for marriage and an office job, and Adolph Menjou as the crafty editor who pulls every trick to keep Hildy on the job to cover a breaking story: the execution of a convicted killer who is more addled political radical than murderous felon. The film opens on a test drop from the scaffold that is to hang Earl Williams (George E. Stone), then the camera glides over to the reporter’s room where the thick-skinned gentlemen of the press prove that they are no gentlemen. Is this the stuff of comedy? It is in the hands of Hecht and MacArthur, former newspapermen with plenty to say about the cutthroat tactics of journalists. These guys are equal parts con men who will do anything for a story, hard-boiled professionals jaded by the job, and public servants out to dig up the hidden dirt of corruption and crime (even if they have to commit a few themselves along the way). And they knew the dirty game of Chicago politics. Though the film never explicitly says so (the opening titles put this in “a mythical kingdom”), this is set in the cradle of Chicago politics, where everything is a matter of power and public appearances, including the impending execution of a socialist who has been railroaded to placate the voters. When he escapes—using the Chief of Police’s own gun!—Hildy and Walter become conspirators in hiding the felon until they can get their scoop and blow the lid off the mayor’s scheme. Billy Wilder’s chief motives in making the third film version of the 1928 Hecht–MacArthur Broadway smash were plain, and he admitted them: he wanted a box-office hit, badly, and this had all the elements for a 1974 killing. It’s a buddy story, a nostalgia piece, a celebration of crusading newspapermen—Woodward and Bernstein, Prohibition-style. Add leftover sets from The Sting for good measure and another re-teaming of the odd couple, Lemmon and Matthau, the latter in a role tailor-made for him. How could it fail? But it did, thumpingly. Why? I’d suggest the very reason that made it such a good movie, so much more than the remake of the remake of the film of the hit play. Everyone said it was a perfect vehicle for Wilder—he did himself—but this is to ignore one crucial difficulty. The Front Page is a lovely old play, and it really is extremely modern. So how does an auteur as strong as Wilder adapt it with the respect it deserves without submerging his own personality? No one could want, after all this time, to see a Billy Wilder film where Billy Wilder simply translates 46-year-old jokes, however good, into celluloid terms. At the same time, no one wants to see a film of The Front Page which ignores the splendid original. The trick was to find an element personal to Wilder within that elaborate framework, and this he did. And this is why the public stayed away, just as they had done from Kiss Me Stupid and The Fortune Cookie and even The Private Life Of Sherlock Holmes (which, for me, is Wilder’s masterpiece). For most of Wilder’s later films tend to be about loneliness, despair, desperation (this is even true, to an extent, of the sunny, romantic and very beautiful Avanti! ), and these things are at the forefront of his version of The Front Page.